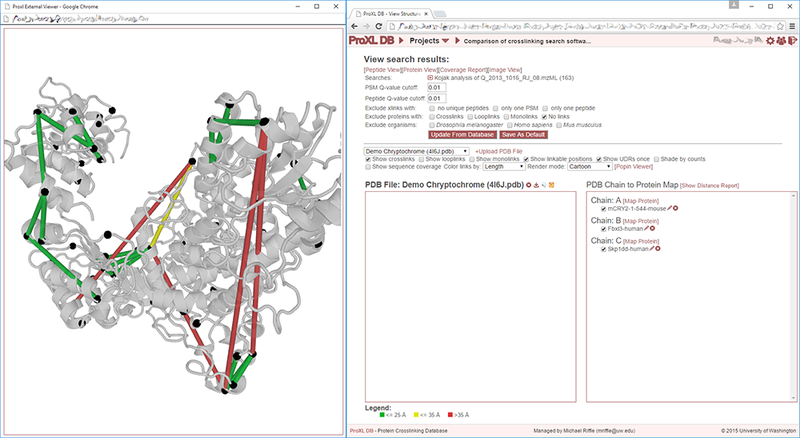 The structure viewer allows users to upload PDB files (including multi-protein complexes) from any source, align protein sequences from their experiment to sequences in those PDB files, and then visualize and interact with the crosslinking results on fully interactive 3D structures. The structure viewer includes multiple filtering and display options, distance reporting, and users may download the data for use in other structure visualization software or as high-quality raster images. Project owners may click “Save as Default” to save the current URL (see above) as the default view of the “Structure View” for this search. 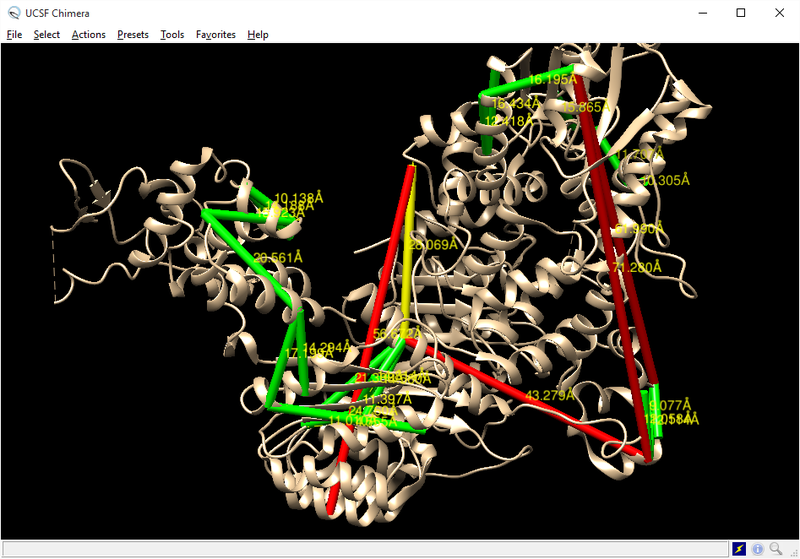 This default view will be populated with the same proteins, positions, and viewer options as when the button is clicked. This is a convenient way to share data with collaborators or the public that does not require that they manipulate the image viewer to see the data. The viewer is separated into two side-by-side panels. 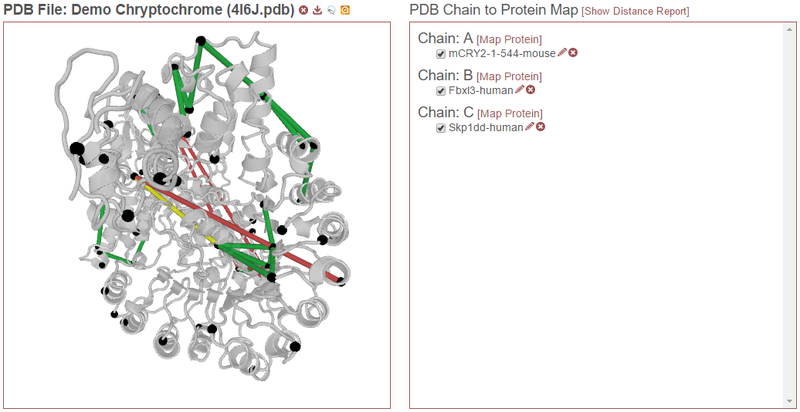 The left panel contains an interactive, 3D rendering of the PDB structure file, link locations from the experiment, and other sequence annotations for those proteins. 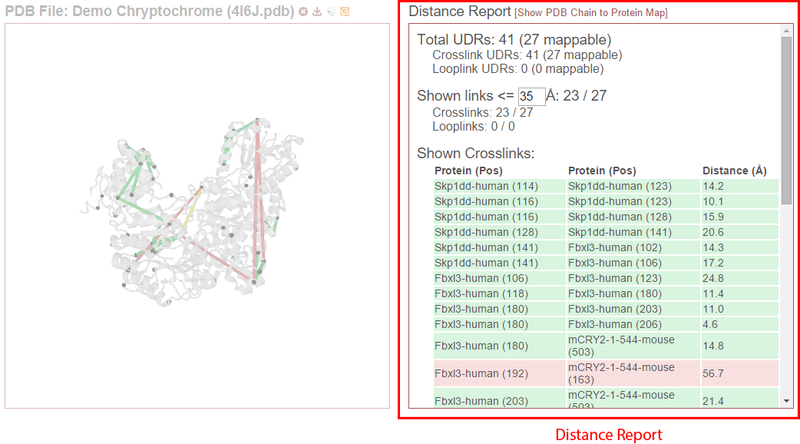 The right panel contains either a report of the distances of the currently-rendered links (see Distance Report) or a form for choosing which protein-PDB chain alignments are currently being drawn (see PDB Chain to Protein Map). Crosslinks (and looplinks, if enabled) are displayed as rods connecting two points in the protein structure. By default, the color of these links is determined by the distance between the two points they connect. (This coloring scheme may be changed, see Color links by.) Monolinks are depicted as short rods connected to the structure on only one end. By default, “linkable” positions are shown as black spheres placed on the alpha carbons of residues in proteins that may react with the crosslinker used in the experiment. 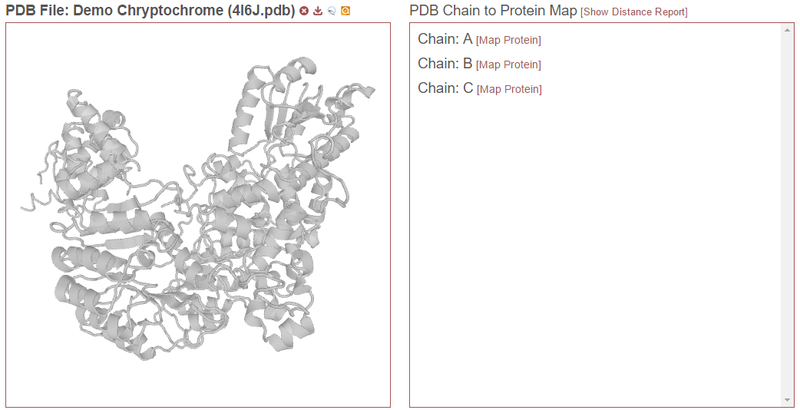 Note that position 1 in Skp1dd does not map to any position in chain C of the PDB file. Position 3 in Skp1dd maps to position 1 in chain C. Position 4 in Skip1dd maps to position 2, Position 5 maps to position 3, and so on. All insertions and deletions are taken into account to create a mapping for every position between the two sequences. 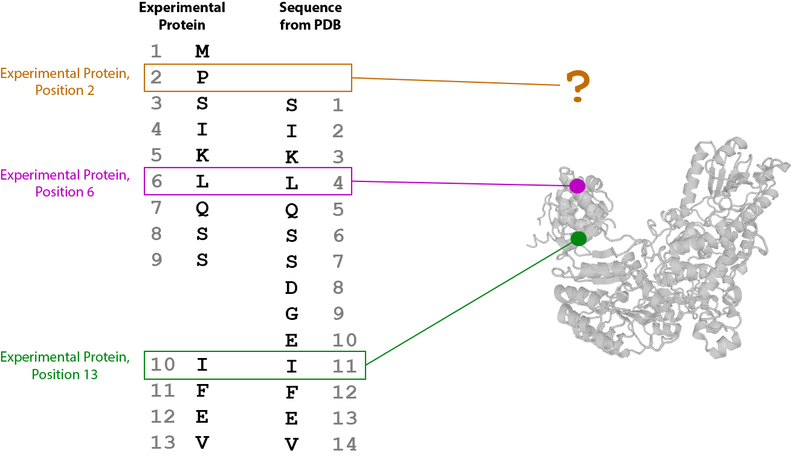 So, then, when drawing (or measuring distances between) positions that correspond to specific residues in experimental proteins, this mapping is used to lookup the corresponding positions in the PDB chain sequences. If the positions map to the PDB, the 3D coordinate position of the alpha carbon in the corresponding PDB residue is used as the location of the residue in the rendered structure. If the positions do not map to the PDB, they are never drawn or measured. In proxl, links that map to the structure on both ends are said to be “mappable”. The distance report displays the number of mappable links from the experiment out of the total number of observed links. See Distance Report for more information. Enter a brief description for your PDB file and click “Upload PDB File.” The PDB file will then be visible in the PDB File pull-down menu. 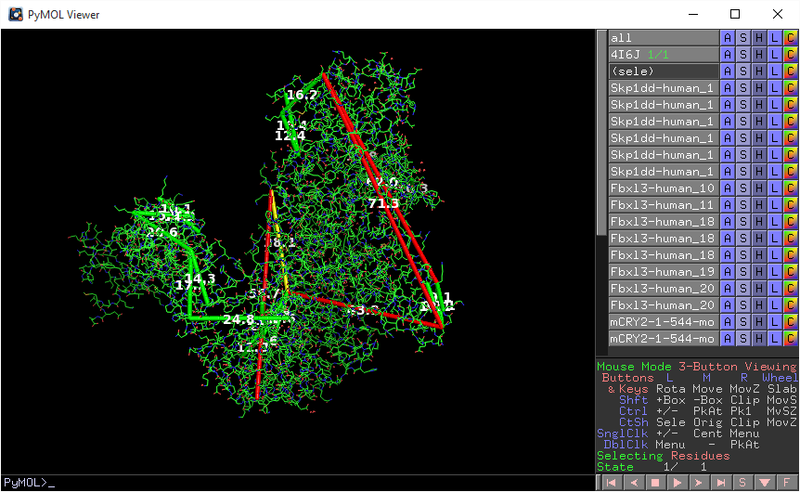 In order to calculate distances or view crosslinking data on a 3D structure, it is necessary to first map proteins from the experiment to sequences present in a PDB file. (To learn more about how proxl uses this mapping to find 3D positions, see Mapping Residue Position to 3D Space.) The sequences in the PDB file do not need to be 100% matches to the protein sequences in your experiment, and may contain insertions or deletions. However, the quality of the reported distances and visualized links depends on the matches being close. 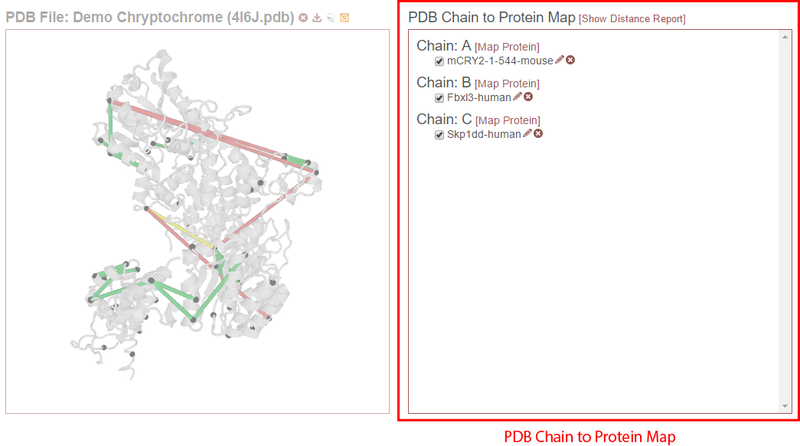 It is also not necessary to map proteins to all chains in the PDB file. 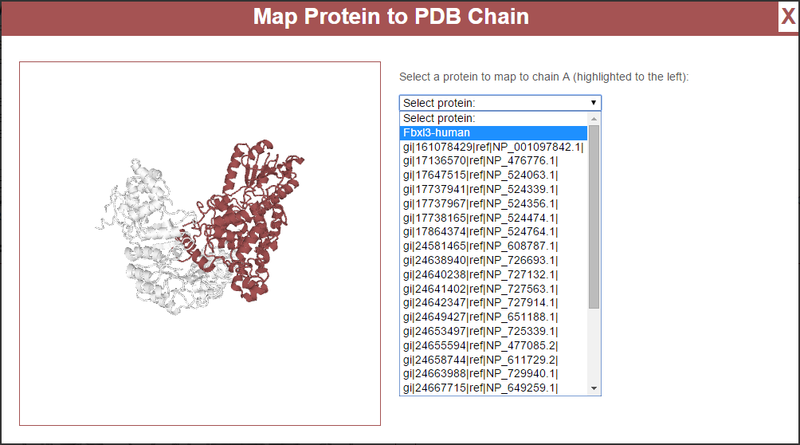 To perform this mapping, first select a PDB file in the PDB file pull-down menu. 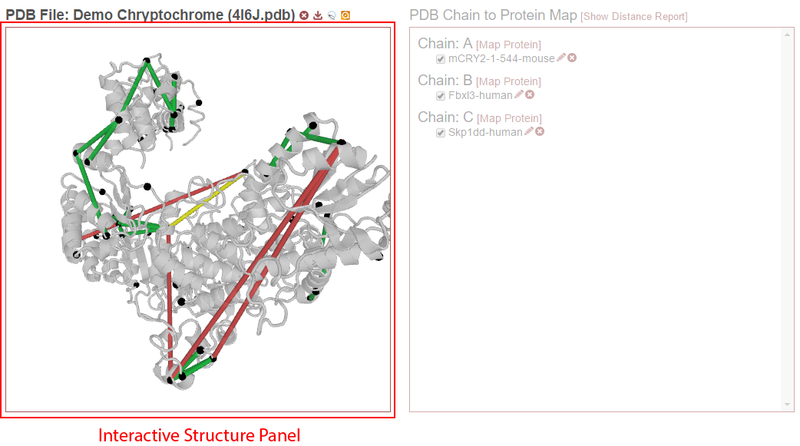 This will display the 3D structure from the PDB file in the left panel and, for proteins with no mapping, a “PDB Chain to Protein Map” in the right panel with no proteins listed for any of the chains. This is an example of a bad match. The pairwise sequence alignment will always be successful, even in the case of poor matches. 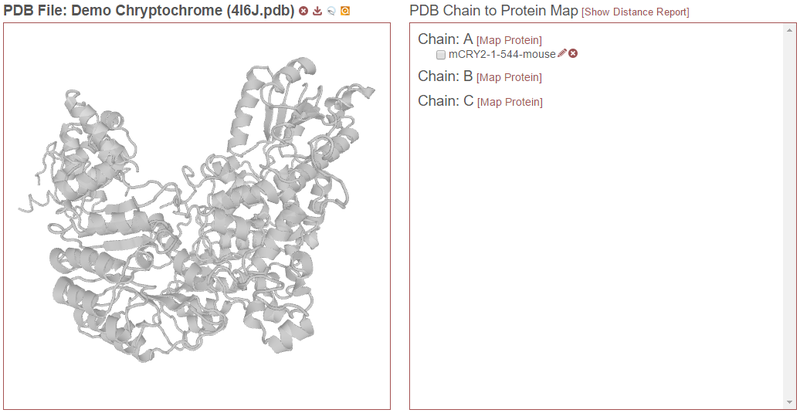 In the example above, “Fbxl3-human” was chosen and a sequence alignment was performed against chain A from 4I6J.pdb. Note that very few residues match between the alignments, and there are many insertions and deletions present. The horizontal scroll bar present beneath the alignment may be used to view the entire alignment. To reject this alignment, click “Cancel” to map a different protein. This process can be repeated for as many other chains as desired. Additionally, each chain may be associated with multiple proteins from the experiment–such as in the case that homologs or proteoforms are present in the search results. However, only up to one protein listed under a given chain may be checked at any given time. Then, to view the crosslinking results on the structure, check the desired protein chain alignments (check box next to a given protein listed under a given chain). To learn more about the effects and implications of checking the alignments, see PDB Chain to Protein Map. Click the red circle (X) icon next to the protein listed for a chain in the PDB on the “PDB Chain to Protein Map” panel to remove that alignment from the database. Using a mouse, the structure may be rotated on a central axis by clicking and dragging in the panel–that is, click, hold down mouse button, and move the mouse cursor in the desired direction of rotation. On touch devices, simply tap, hold, and slide finger in desired direction of rotation. To zoom in or out using a mouse, use the scroll wheel–slide the scroll wheel towards you to zoom in and away from you to zoom out. On touch devices, pinch and zoom with two fingers to zoom in or to zoom out. Double clicking on the structure will move the center of rotation to that point and re-center the view of the structure to that point. 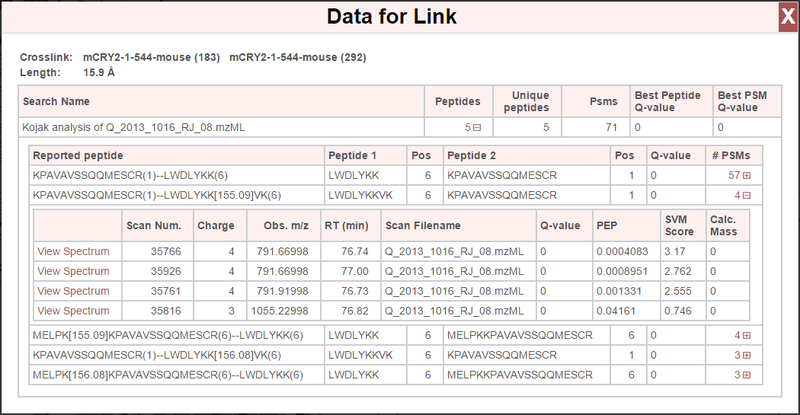 Any link (crosslink, looplinks or monolink) may be clicked on to view underlying link information (such as which positions in which proteins are connected), a peptide list for peptides found to support those links, a list of corresponding PSMs, and view associated spectra. The “View Spectrum” link for each PSM will show the respective spectrum using the built-in spectrum viewer. See Spectrum Viewer for more information. Right-click the structure to save the current view as an image. This image has the same dimensions as the view window. To capture a high resolution image of the structure, use the Popout Viewer function to view the structure in a separate window, make that window as large as possible and then save the view as an image. Resizing the new window dynamically changes the size of the structure viewer so that it always fills the window. The separate window allows for enhanced exploration of the structure. Not only is the structure larger and easier to see, but clicking on links in the viewer will open windows for those links in the original window without obscuring the structure. This is further enhanced in a multi-monitor environment, where it is possible to run the structure viewer full-screen on its own monitor. The separate window also allows for the download of much higher resolution images of the structure, since the downloaded image has the same resolution as the 3D rendering of the structure. To download the image, right-click on the structure in the new window and choose to save the image to your computer or device. To pop the structure viewer back into the original panel, simply close the new window or click the “[Popin Viewer]” link where the “[Popout Viewer]” link was originally. Project owners may delete a PDB file from by clicking the red (X) icon above the structure view panel. This will remove the PDB file from this project and make it unavailable to users of the project. Note, if the same PDB file has been uploaded to other projects, those will be unaffected. Project members (or public access users, if enabled) may download the PDB file by clicking the download icon above the structure view panel. This file is suitable for viewing in structure viewing software such as Chimera or Pymol. 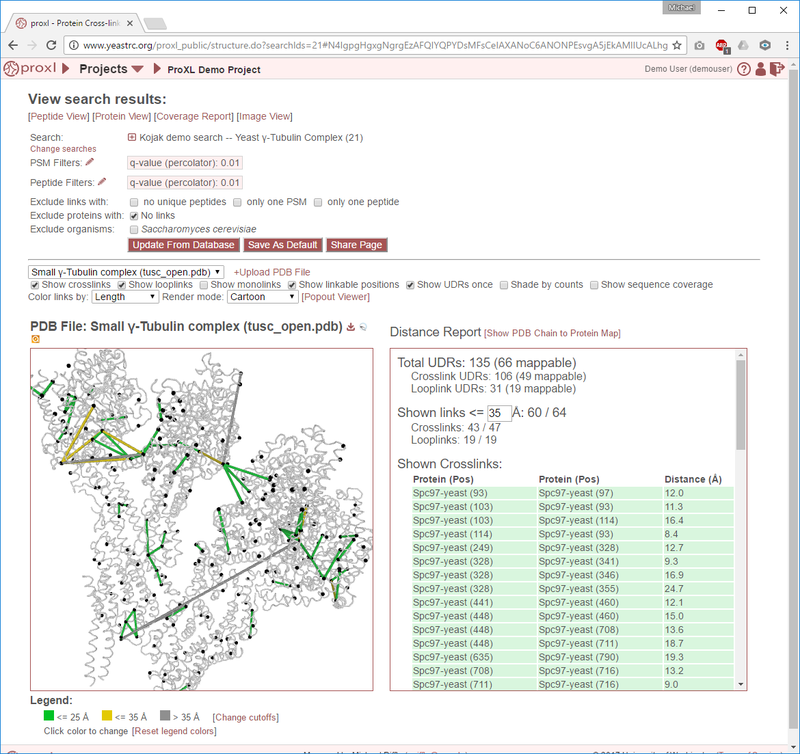 Project members (or public access users, if enabled) may download a Chimera script that will draw the currently-visible links onto the current PDB file by clicking the Chimera icon above the stucture view panel. This script may be run in Chimera after loading the PDB file, by choosing “File->Open”, choosing the script that was downloaded, and choosing “Chimera Commands” as the file type. Project members (or public access users, if enabled) may download a Pymol script that will draw the currently-visible links onto the current PDB file by clicking the Pymol icon above the stucture view panel. This script may be run in Pymol after loading the PDB file by typing “@C:locationtoscript.txt” in the Pymol command line (where C:locationtoscript.txt is the actual location of the downloaded file). Note that it is possible for a given chain in a PDB to be aligned to multiple proteins in the experiment, such as when homologs or proteoforms were present in the proteomics search database. In this case, only one alignment for a given chain may be checked at a time. This behavior may be changed, see Show UDRs once for more information. 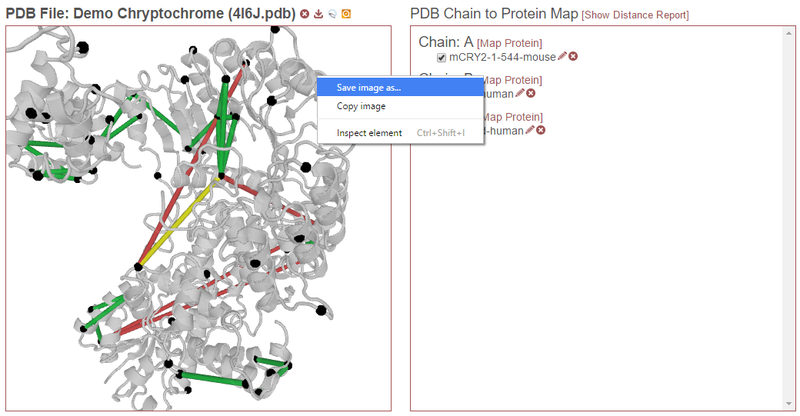 For a description of how to map proteins to chains in the PDB file, see Map PDB Chains to Proteins. Owners may click on the edit icon (pencil icon) to either view or manually edit the alignment. Non owners may click on the examine icon (magnifying glass icon) to view the alignment. Project owners may click on the edit icon (pencil icon) next to the protein/PDB alignment they wish to view or edit. Project owners may click the delete icon ((X) icon) next to the protein/PDB alignment they wish to delete. Deleting the alignment removes it from the database and makes it unavailable for all users. This section describes the functionality and features of the right panel when the distance report is being displayed. 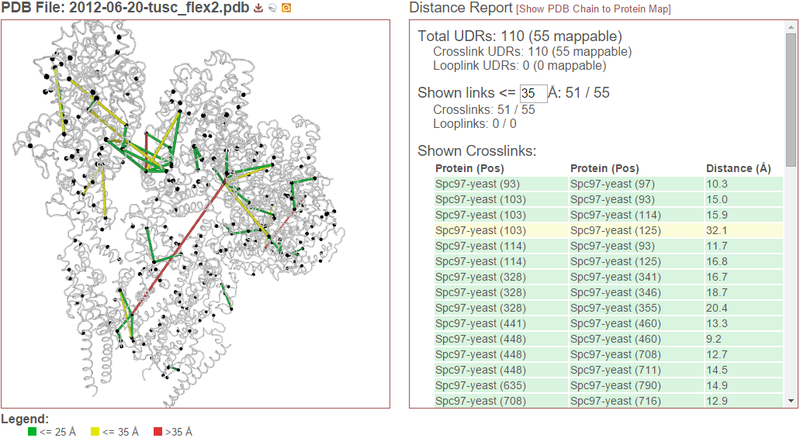 To display the distance report, click the “[Show Distance Report]” link above the PDB Chain to Protein Map. Links are drawn (and distances measured) between alpha carbons from PDB residues mapped to the respective residues from the experimental protein. To learn more about this mapping, see Mapping Residue Position to 3D Space. UDR stands for “unique distance restraint.” In proxl, this is the name for a distinct position in a protein linked to a distinct position in the same or another protein. This section of the distance report reports the total number of such UDRs present in the data, and how many of those are mappable to the structure. 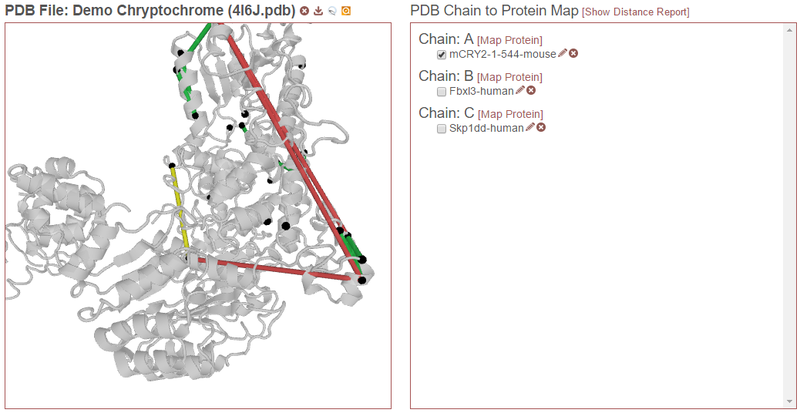 To learn more about what “mappable” means or about how proxl maps protein positions to PDB structure, see Mapping Residue Position to 3D Space. This section shows the number of UDRs (that were mappable to the structure) have distances less than or equal to the supplied distance cutoff. (This defaults to 35 Angstroms.) This cutoff may be changed simply by changing its value in the text field–the report will dynamic update as the value is changed. These tables list the crosslinks and/or looplinks currently being shown on the structure. The coloring of the rows matches the coloring of those links on the structure–even if an alternate coloring scheme is chosen (see Color links by). Each of the rows shows the positions in respective proteins that are linked, as well as the distance of that link in Angstroms. All of the currently drawn crosslinks and/or looplinks will be listed in the table. Each row may be clicked on (or tapped on touch devices) to view the underlying peptides, PSMs, and spectra. See Click on Links for more information. At the bottom of the “Distance Report” panel is “Download reports”. Click on the name of the report to initiate a download. Protein Position to PDB Mapping - A tab-delimited file showing the pair-wise mapping of the protein sequences in the experiment to the PDB file. 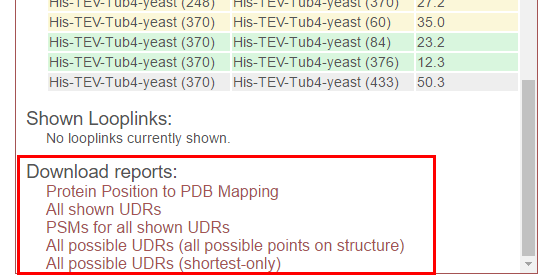 All shown UDRs - A tab-delimited report of all currently-displayed UDRs, showing protein positions, distances, and PSM/peptide scoring statistics. PSMs for all shown UDRs - A tab-delimited report of all PSMs for all currently-displayed UDRs, including scoring statistics for those PSMs. All possible UDRs (all possible points on structure) - A tab-delimited report of all theoretically possible cross-links on the structure, given the cross-linker that was used. All possible UDRs (shortest-only) - A tab-delimited report of all possible cross-links on the structure, given the cross-linker that was used. Only the shortest cross-link for each unique protein pair and position is reported. This is useful when proteins appear more than once in the structure. Toggle the showing of crosslinks on and off. Toggle the showing of looplinks on and off. Toggle the showing of monolinks on and off. Toggle the showing of linkable positions. Linkable positions appear as black spheres on the alpha carbons of residues in the PDB that mapped to linkable positions in the experimental protein. A linkable position is a residue expected to be theoretically linkable by the crosslinker used in the experiment. Maybe I should delete this feature. If enabled, the color of the structure, itself, will reflect the sequence coverage for the protein mapped to the respective chain. 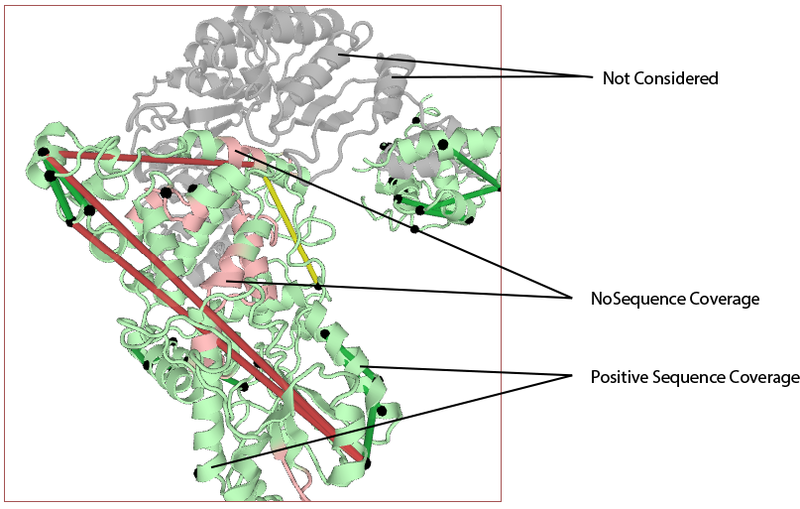 Segments of the structure will be shaded green where those residues map to experimental protein residues that were contained in any observed peptide (at the given cutoffs). Segments will be shaded red where no peptides were observed that contained those residues. 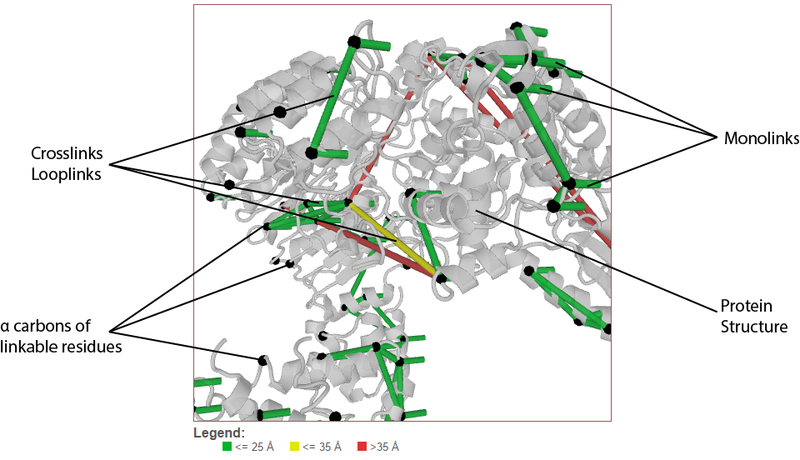 Areas of the structure not being considered (either residues that do not map to experimental protein residues orno protein/PDB aligments are enabled for that chain) will appear as white. This pull-down menu alters the coloring applied to the links. The three options are 1) Length (default), 2) Type, and 3) Search. This option colors links based on their length. This option colors links based on their type–crosslink, looplink, or monolink. When merging multiple searches (maximum of 3), this option colors links based on which search(es) they were found in. This allows for a quick, structure-based comparison of results between searches. Provides a helix, strand coil cartoon view of the structure. Draws the structure as a smoothed line tracing consecutive alpha carbons.. Draws the structure as straight lines connecting consecutive alpha carbons. Draws the struture at atomic resolution using lines for bonds. Draws the structure as point cloud of all atoms. This option limits which proteins will appear in the pull-down menu for mapping proteins to PDB chains. Proteins that contain any of the checked options will not appear. For example, checking ‘No links’ prevents proteins that do not contain crosslinks, looplinks, or monolinks from appearing. This will also prevent any links involving excluded proteins from being drawn on the structure. This options limits which proteins will appear in the pull-down menu for mapping proteins to PDB chains. No proteins from any of the checked organisms will appear. This will also prevent any links involving excluded proteins from being drawn on the structure.